This Triple Berry Shortbread Bar recipe is by far my favorite bar recipe. 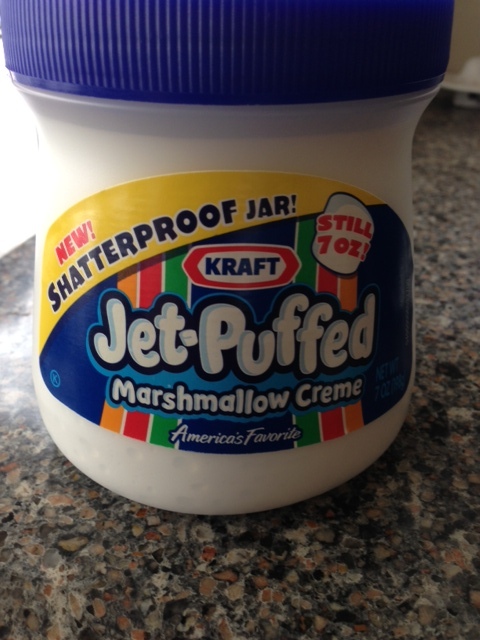 If you haven't tried it yet, I HIGHLY recommend it. It really is life changing....seriously. The combination of the butter, almond flour, triple berry jam and toasted almonds is amazing. 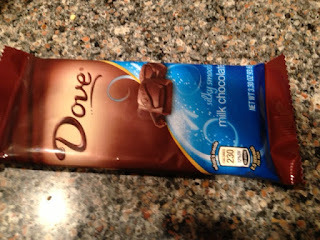 One bite of these bars and you're hooked! This new bar recipe is also on the top of my list. Instead of almond and triple berry jam, it has a delicious combination of toasted coconut, oatmeal and raspberry jam....yum. I hope you'll give this recipe a try. Line a 13"x9" pan with nonstick foil or spray regular foil with nonstick cooking spray. Put the raspberry jam in a bowl and stir well to loosen. This will make it easier to spread in an even layer instead of in clumps. 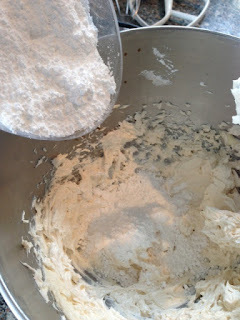 In the bowl of your food processor, combine the flour, sugar, and salt and pulse until combined. 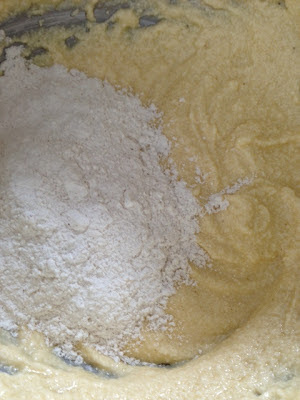 Add the cold, cubed butter and pulse until a dough forms. 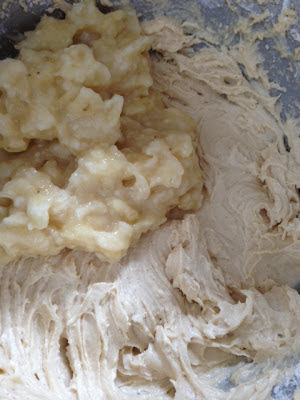 Transfer the dough to a large bowl and add the oatmeal and 3/4 cup of toasted coconut. Incorporate with your hands until combined. Save 3/4 cup of dough. 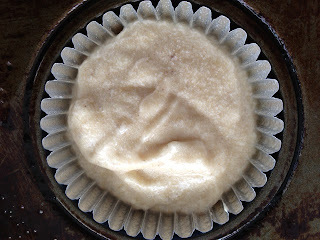 Transfer the remaining dough to the prepared pan and press into an even layer. 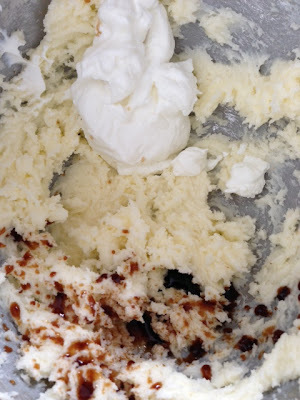 Spread the raspberry jam on top of the dough and spread into an even layer. Crumble the remaining dough on top and sprinkle with the untoasted coconut. Bake at 375 for approx 25-30 minutes or until golden brown. Remove from oven and transfer to a cooling rack to cool completely. Cut into bars and serve. Leftovers can be stored at room temperature in an air tight container for 2-3 days. Faye and I both have the privilege to be able travel with our careers. In April and May, both Faye and I were in Hong Kong, China and India separately. With both of us being foodies, we love the opportunity to see how other cultures eat and cook. In my recent trip to India (wonderful, loving people! ), I was treated to some delicious Indian mangos! 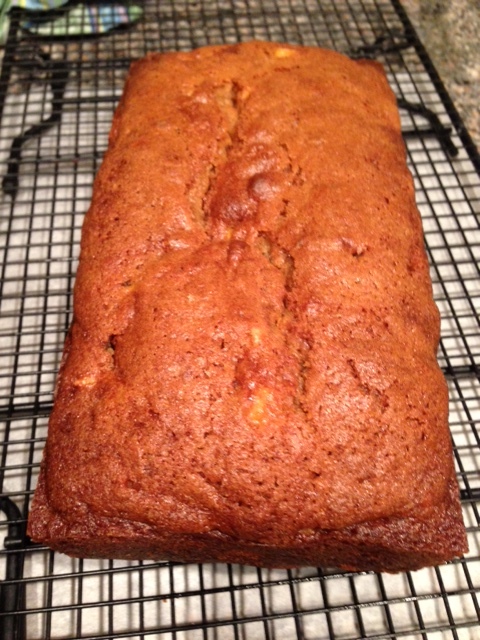 So with mangos on my mind, I created this yummy mango bread. 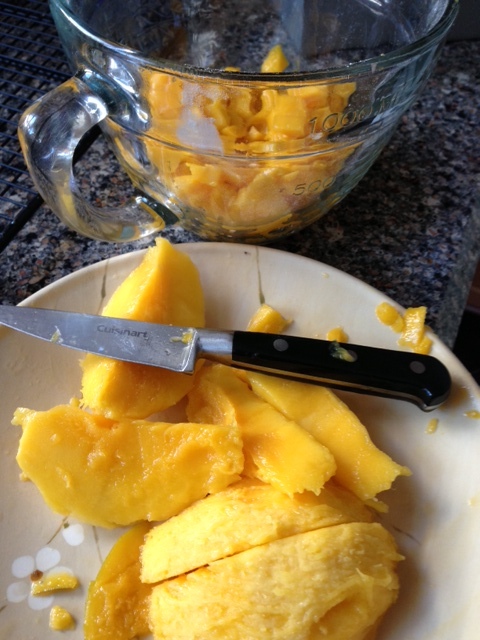 I kept the mango as true to itself as possible (in other words, not making it into a pulp). I wanted to make sure everyone knew the type of bread they were eating. 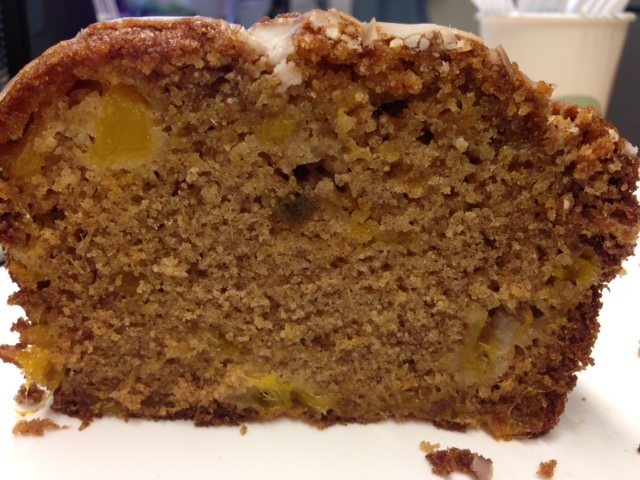 The flavor of fresh mango, baked into a bread with a little hint of spice. I hope you enjoy this recipe! 1. 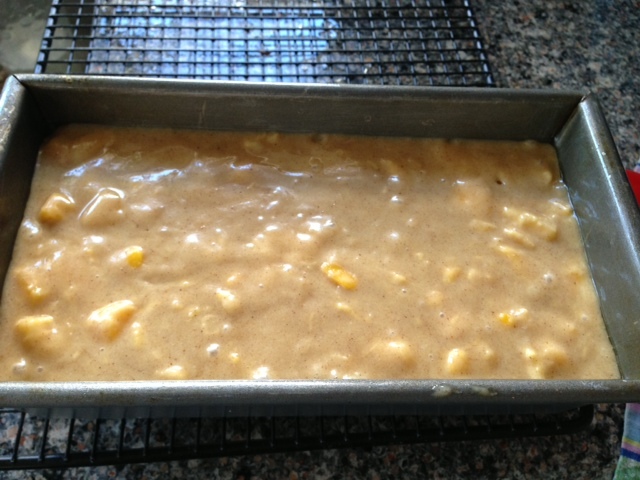 Can an 8"x4 ½" loaf pan with nonstick cooking spray. 2. 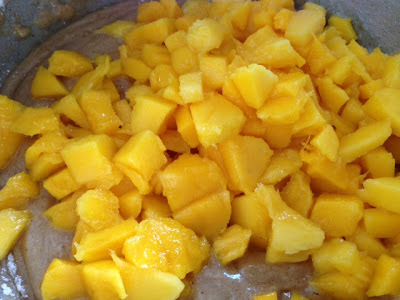 Slice mango as close to the seed as possible. Cut the slices into cube size pieces. Set aside. 3. 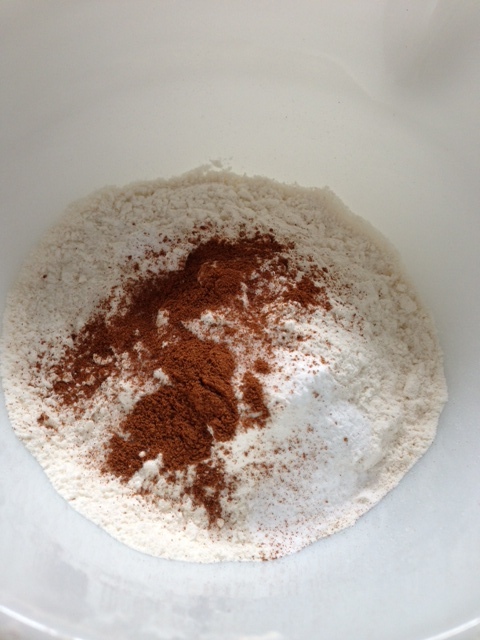 In a medium size bowl, combine flour, cinnamon, ginger, baking soda, salt and sugar. Mix till well combined. Set aside. 4. 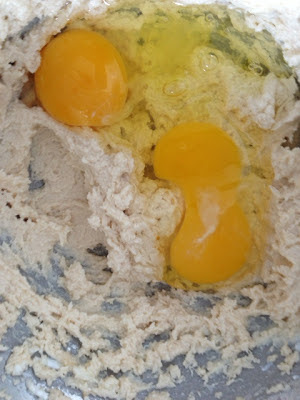 In a large bowl, beat eggs with oil till combined. 5. Gradually add flour mixture to egg mixture till all combined. 6. To batter add, fresh mango and mix with a spoon till combined. 7. 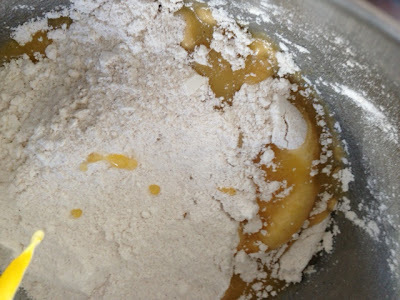 Pour batter into bread pan. 8. Bake for 1 hour, remove from oven and cool. 9. 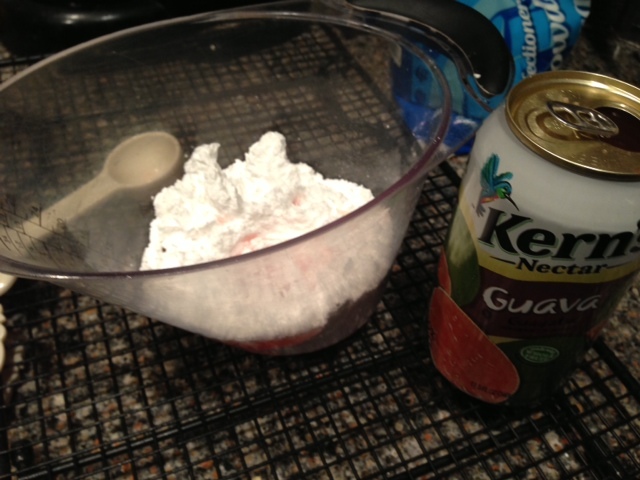 In a small bowl, combine powder sugar with guava juice. Gradually add the grava juice till the consistence is thick but still thin enough to pour. 10. Once bread is cool, pour the glaze over the bread and let dry. Yumm.. The Campbodians famous Banana boats! What is a Banana boat? That is what I said the first time I heard of it, well…it’s a camping treat my boyfriend's friends (referred to as the Campbodians= a group of Pilipino men that love VW buses and camping) have been making for years. 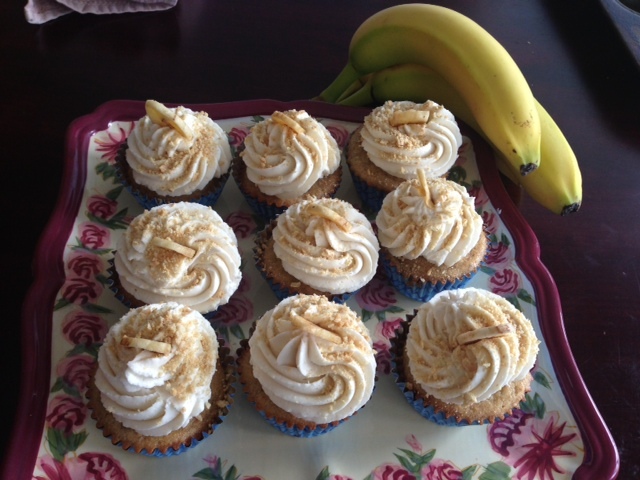 Picture this…a banana stuffed with pieces of chocolate, marshmallows and topped with graham cracker crumbs and sprinkled with cinnamon , wrapped in foil and cooked over an open fire till the bananas are warm and the chocolate and marshmallows are nice and soft and gooey . Pure heaven. Well, I have been craving these for awhile. Earl was nice enough to make them for my family a few weeks ago and they were a hit! But I kept thinking how to make these favors into a bake good. 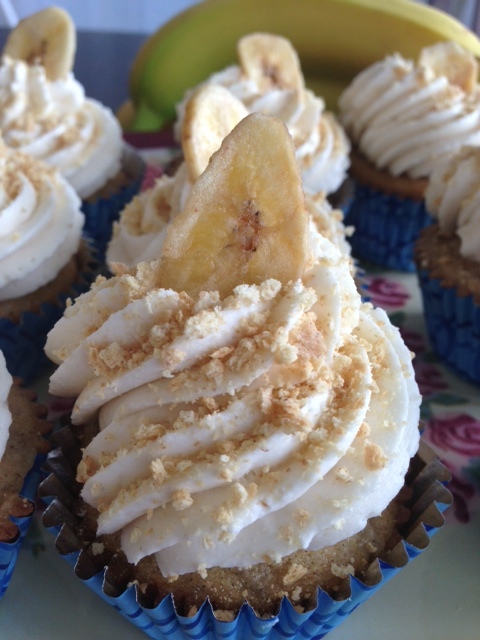 Well, I created a banana-cinnamon cupcake stuffed with chocolate pieces frosted with a marshmallow frosting and sprinkled with graham cracker crumbs, the birth of the BANANA BOAT CUPCAKE. 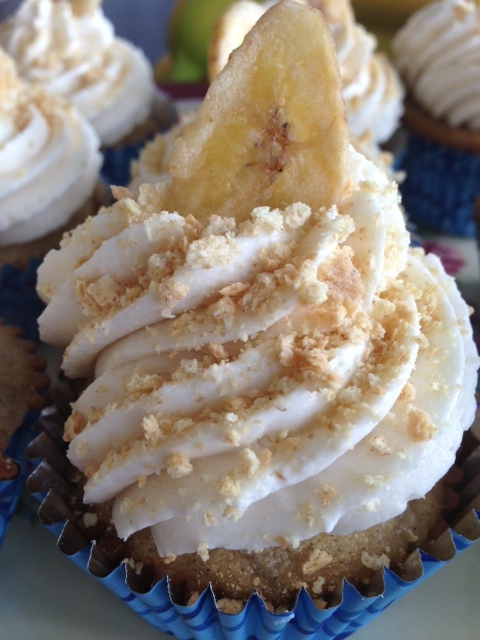 There is nothing like a banana boat over a open fire, but this cupcake is delicious. 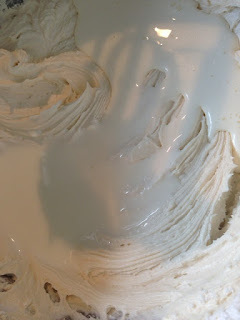 The flavors are so good and the frosting is AMAZING! I really hope you give this cupcake a try. 1. In a small bowl, combine flour, baking powder,baking soda, salt and cinnamon. Mix and set aside. 2. 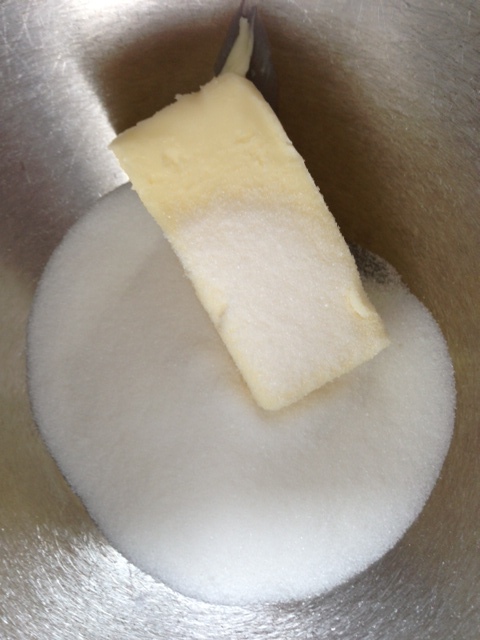 In large bowl, beat butter with sugar. 3. 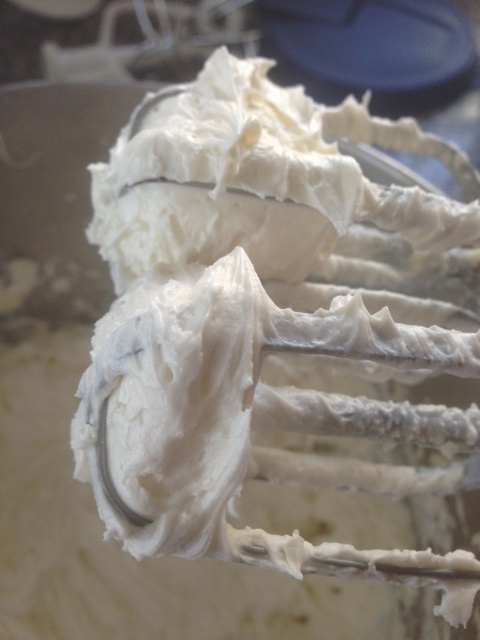 Beat in Sour cream and vanilla. 5. Add half the ingredients and beat in till combined, then beat in the other half. Do not over beat. 6. 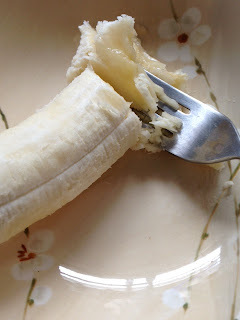 Beat in the mashed banana to batter. DO NOT OVER BEAT, just till combined. 7. 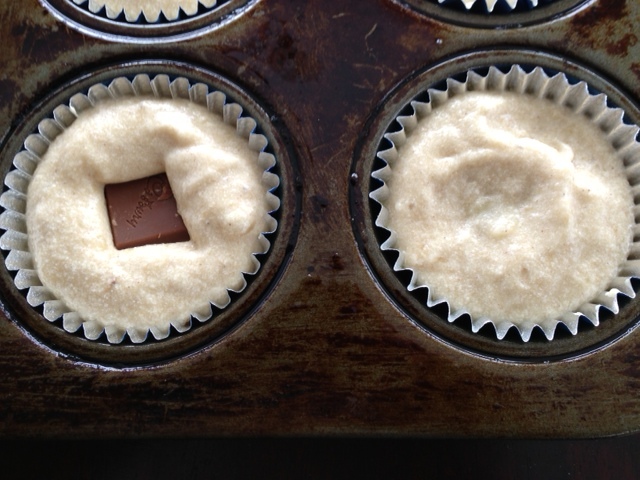 Fill cupcake liners ¾ full. 8. Once all the cups are filled. Add one square of chocolate in the middle of each cup. Batter will push up a bit on the sides. 9. 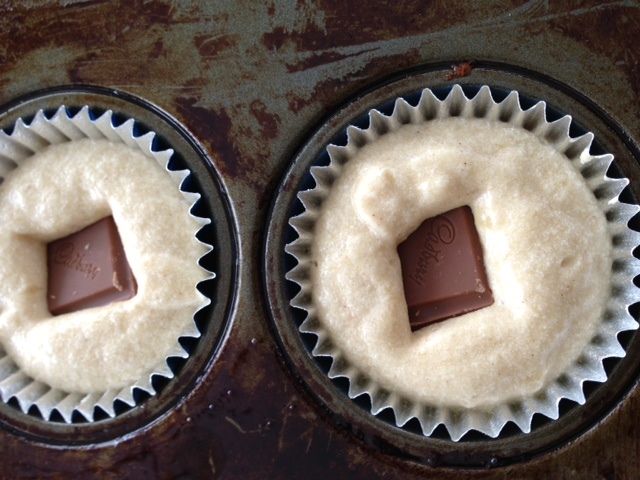 Take a spoon and cover the chocolate with the batter that pushed up. 11. 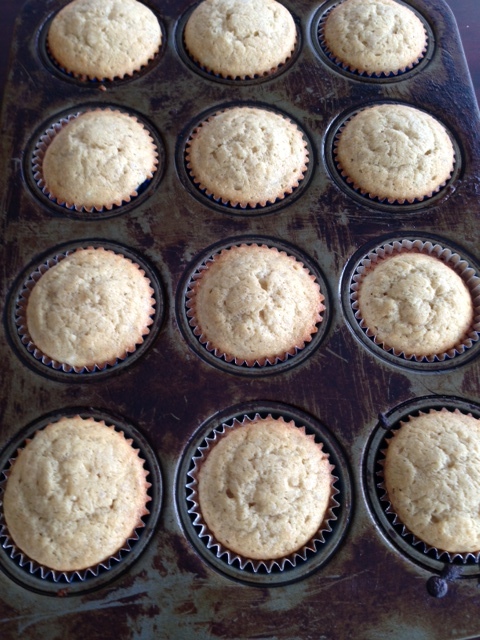 Once removed from oven, wait about 3-5 minutes then transfer each cup to a cooling rack. Cool completely. 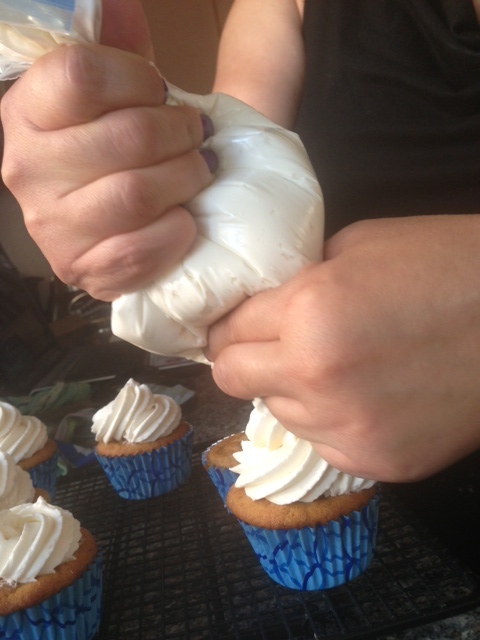 While the cupcake are cooling…make frosting. A. 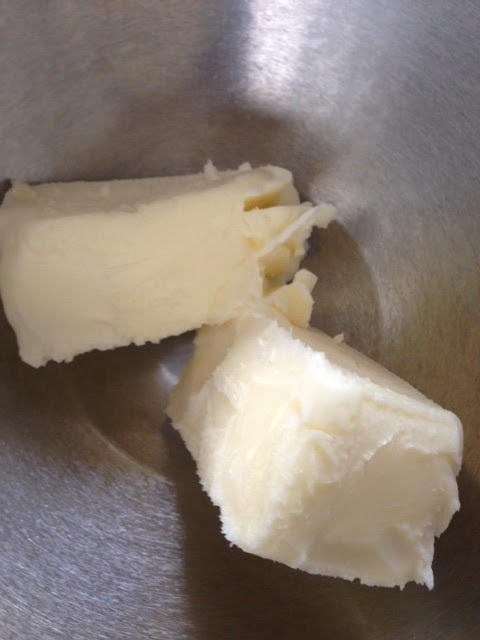 Beat butter until it is smooth. B. Add vanilla and marshmallow cream till all combined. C. Gradually add powdered sugar at low speed. 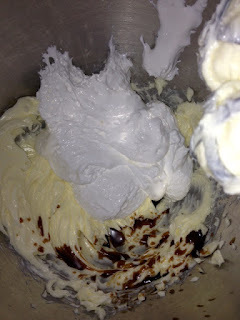 D. Add half and half and beat at high speed till nice and fluffy. E. Frost and decorate as desired. 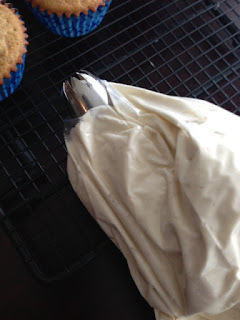 I used a ziplock bag, cut off at the end and fitted with a decorating tip.